Before we get started, we want you to know that Oodlesbid.com is not your traditional online auction site. We have developed a very fun and exciting online auction experience and we hope you keep coming back to try to win the best items on any auction site. First, you need to register for an account so you can bid in an auction. Some of you are Founding Members, so you will need to sign up with the email you gave us for your account to reflect your status. Once you have opened your account, you are ready to move on to the next step. The next thing you should do is watch the How to Bid video or read these directions on How to Bid. It is important that you do this so you know all about how to bid on the auctions you want to participate in. Now that you have watched or read the How to Bid information, let’s look at the nine categories you can choose to bid on. Because the site is new, not all of the categories may be open, but they will be soon. When you click on a category, you will notice that there are three prizes you will be bidding on. Win the auction and you get your choice of one of the three prizes shown. The winner of an auction gets up to three business days to choose the prize they want within the category they won. Each auction that is shown on the screen offers a different bidding cost. You may purchase bids by credit card or Paypal. For example, let’s look at the Fun Toys category. Ten bids for this auction will cost you the amount indicated. The cost of bids varies depending on the category you choose, so always be aware of what the bids cost and how many bids are included. Oodlesbid.com is a auction of skill. You have to be very careful with your bids, as you cannot buy more than the set amount for your auction. Everyone is equal going into the auction, making this the fairest auction in the industry. We strongly suggest that first time bidders start with the category Fun Fast auctions. It’s a great place to learn, hone your bidding skills, and still have an opportunity to win some great prizes. Each auction has a finite amount of bidders and there are only so many bids per bidder and per auction. Each auction has to be fully subscribed before it can begin. This means that the required amount of bidders has to be met in order to start the auction. Once the auction is fully subscribed, each bidder will be sent a notice to their Oodlesbid.com registered email address or other registered social media address. The notice sent to you will explain the day and time your particular auction will be begin. Note* Note: Due to the age of Oodlesbid.com, it will take some time to have the auctions fully subscribed. To help expedite the process, tell all your friends and business associates about Oodlesbid.com so the auctions are subscribed to faster. Once the auction you have chosen to bid in has been fully subscribed, you will receive a notice stating what day and time your auction will begin. You will have a minimum of three days before bidding begins. For your convenience, you can bid from most smart devices. OOdlesbid.com does not allow teaming up in any auction. 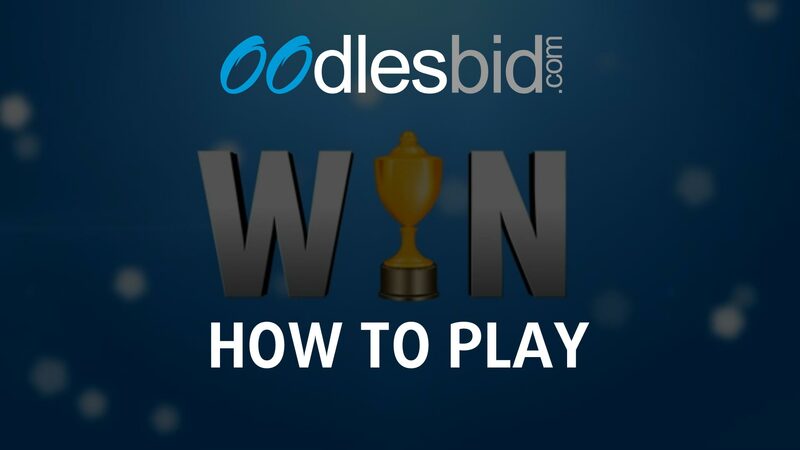 If it is discovered that more than one bidder was involved in an auction win, the bidders will be disqualified, forfeit their prize and lose their right to bid on Oodlesbid.com forever. Oodlesbid.com may take up to (10) days to arrange for the winner of a trip or shopping spree in Categories Fantasy Vacations, Fun Fast Auctions, or For The Ladies, due to the need to make arrangements with travel agencies, Resorts & Spas, or Department stores nearest your residence. Let’s say you have received your auction notice and it’s time to begin your auction. Get to your computer or smart device a little early, go online, and check in. Once you have clicked on your auction, the site will recognize your email address and place you in the auction. You will notice there is a clock that is counting down to the start of your auction. When the clock hits (0), your auction has begun. The clock now switches to a (20) second clock, so you have to be very focused. It is very important that you play the clock and watch your bids, as you only have a limited number of them. Each time you bid, the clock resets to a fresh (20) seconds. If you don’t bid but someone else does, the clock resets. If no one bids and the clock runs out of time, the last person who did bid WINS the auction. If the bidding is slow, the auction clock switches from (20) seconds to (15) seconds, and if the auction is still not moving at a good pace, it will switch to a (10) second clock. It is important to watch the clock! The last 10 bidders will always be shown on the side of the screen, so you can see who you are bidding against. Also displayed is the total number of remaining bids in the auction amongst all bidders. Sometimes during the thrill of the auction, many bids go unused. When the clock hits zero, the last bid captured wins…even if bidders still have unused bids. Our auctions are based on trying to manage bids and hoping that other bidders will keep resetting the clock. Just because someone bids and resets the clock doesn’t mean you have to bid. The key to a win is having as many bids as possible left so you can time your bids to be the last bidder when the clock runs out. The winner of the auction is determined to be the bidder who last bid before the time ran out. Winning an Oodlesbid.com auction and getting your luxury prize is exhilarating. Ah, the thrill of victory! There really is nothing like it. To bid in this auction, you must first register for this online event. When the bidder limit is reached, the auction will go live. No hidden fees. Just great games for a great price. You must register for this auction by December 31st 3:00pm EST to participate. Win $10.00 credit on OOdlesbid.com. This credit can be used to buy into auctions. When the timer is under 20 seconds, every bid extends the clock. You can help us improve your experience by taking a short survey. I am not interested in this item. I do not know how the site works. I do not know how the site works, but I am interested in buying the item. I cannot afford the buy in price. © 2013-2018 OOdlesbid.com, All Rights Reserved.